This is a real time video feed of nesting Great Blue Herons on the Petaluma River. This is a new colony on the Petaluma river. There has been an active rookery of Great Egrets, Snowy Egrets and Great Blue Heron across the Petaluma River from Shollenberger Park since 2003. This is nest #3 in a newly-formed colony about one kilometer from the Shollenberger colony. There are four active nest as of late March. It is called the "McNear colony" as it is close to the McNear peninsula. It is now included in a study by the Cypress Grove Research Center (CGRC), Audubon Canyon . This colony is one of over 150 being monitored regionally within the Heron and Egret Atlas Project. The slender, poised profiles of foraging herons and egrets are distinctive features of wetland and shoreline ecosystems. To many observers, these conspicuous birds signify the presence of potentially diverse and healthy wetlands worthy of protection . Consequently, herons and egrets are frequently used as symbols of wetland conservation….Such recognition is well documented by the ecologically important roles they play. 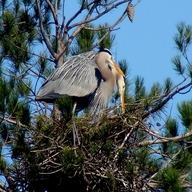 As important predators, herons and egrets are sensitive to subtle changes in ecosystem productivity, hydrology, and vegetation, and (although their responses are not completely understood), they are recognized widely as indicators of processes that sustain or threaten wetland ecosystems. Dr. John Kelly is the Director, Conservation Science and Habitat Protection, Audubon Canyon Ranch and manages the heron and egret research project. He is widely recognized as an expert in colony management. He assigned Len Nelson and me as monitors for the colony across from Shollenberger Park in 2003. We provide periodic reports to CGRC under protocols established by Dr. Kelly, and have received training from him. This data is shared with other entities, such as the PRBO Conservation Science, based adjacent to Shollenberger. For more information on protecting these birds go to saveshollenberger.com.